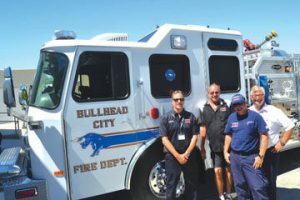 Do you have a used fire truck or ambulance that you need to sell? If so, you're in luck! We help fire departments all over the world sell their equipment for the best prices. Our easy to use online brokerage helps you turn your old trucks into the cash your department needs today. We are ready to help you determine the value of your truck. All you've got to do is fill out the form below and tell us about the truck you want to sell. If your truck needs repairs, no problem - our mobile EVTs can repair your truck so she's ready to go for the next owner. Our experienced team is happy to reach out to you to discuss your needs and give you insight on what the truck is worth. Here's the deal - we will advertise your truck to thousands of fire departments across the world for free. When your truck sells, you get a big check and give us a small brokerage commission that's the same or lower than the other guys. We'd love the opportunity to work with your department and show you how easy it is to sell your used trucks. Enter your info below to access the listing builder. If you have any questions please feel free to give us a call at 866-876-0979. Thanks!